A beginner Go player's blog. A blog about go books and go sightings. 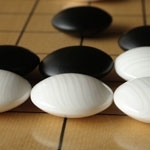 "This blog will let me publish some ideas I come up with while playing games, mainly Go (baduk) but also some other hobbies, like kiting and so on." "The long, slow, and arduous journey to gain yet another stone." "This is the story of my study of the game of Go during my hard earned retirement. Studying Go is about as close to working as I plan to get, at least for awhile. I'll let you know if I get bored."